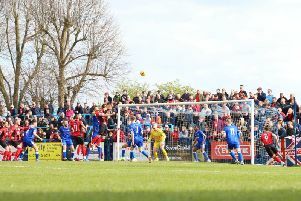 Marcus Law has urged his Kettering Town players to make sure they don’t become a team of “ifs, buts and maybes”. The Poppies are gearing up for their first home game of the new season when they take on Redditch United at Latimer Park tomorrow (Tuesday) night. Newly-promoted Kettering suffered a nightmare journey to Poole Town on the opening day of the Evo-Stik Southern League Premier Division campaign as they didn’t arrive at Tatnam until 3.15pm due to heavy traffic. They conceded after just two minutes and were unable to find a way back into the game as they slipped to a 1-0 defeat while also having Dubi Ogbonna red-carded for two bookable offences. Law is now preparing to pit his wits against Redditch manager Liam McDonald, who played under the Poppies boss during his first stint at Kettering four years ago. And he knows his new-look side has things to work on ahead of their first game at Latimer Park this season. “I know Liam well and Redditch will be a decent side so it’s another big test for us,” Law said. “Hopefully it will be a good game for the fans to watch. “I have said before that we are a new team and it will take time for it all to come together but that’s the challenge and I am relishing it. “The one thing I don’t want us to be is a team that talks about ifs, buts and maybes. “There are things we need to work on after the weekend and I certainly think we could be a bit more robust.